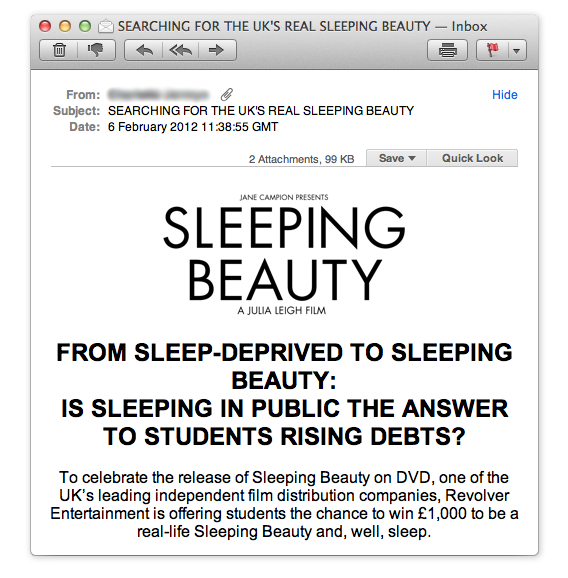 A PR stunt by Revolver Entertainment has been announced to promote Sleeping Beauty, an ‘arthouse’ debut by Julia Leigh, starring Emily Browning (review on the Guardian here). The film has nothing to do with its fairy tale namesake, and is instead about a student who gets paid to lie unconscious while men ‘manhandle and abuse’ her. Nice. The stunt, promoting the release of the movie on DVD, is offering one UK student the chance to win £1,000, for doing nothing. The competition has been described as ‘misjudged’ by MovieReviews.co.uk, and ‘the most inappropriate PR faux pas we’ve seen in a long time’. “The lucky winner will be tucked up in a luxurious bed in a public place on Tuesday 21st February for 12 hours (breaks included!) and will be awarded with £1000 for doing absolutely nothing! Could you do what Lucy does and enter a mysterious world to gain yourself some extra cash? What would you do for quick money? To be the real Sleeping Beauty you only need to be three things: a STUDENT, AVAILABLE on Tuesday 21st February and BE UP FOR A NAP! More information about the competition can be found at the movie’s website. Source: moviereviews.co.uk, tweeted by Tyler Peters. Also UltraCulture. 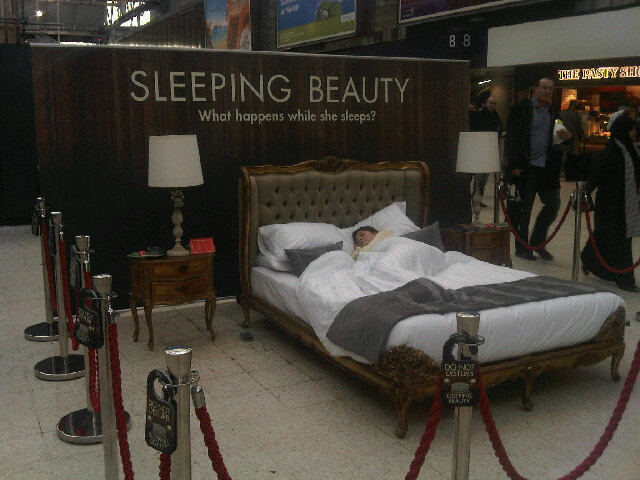 UPDATE: on the 23rd February, the stunt took place at Waterloo Station. Here’s a picture, courtesy of Mischief PR’s Jennifer-Rosellen. Not sure what the fuss is about – the film is valid for all that it explores an unpleasant theme and this stunt is in keeping with the film without in any way being exploitative. Inclined to believe that the PR has worked for this film. I definitely wouldn’t have heard of it had it not been for the fuss over this competition.